Beach Landings on every Jump! Experience the Ultimate in Beach Tandem Skydiving with amazing coastal views over Fraser Island and the spectacular Coloured Sands that Rainbow Beach is famous for. Freefall at speeds up to 220 kilometres per hour then enjoy the views of the coast before landing right on the surf beach! Tandem Skydiving is the best way to do your first skydive - secured to an experienced instructor. You will be fitted with a harness and are secured to your Instructor by four strong points. Grab your personalised video and photos as a great memory and tell a great story in themselves! Photos are taken before you get in the plane, of the awesome scenery on the flight up, then when the door opens, while you are in the door about to jump out, the entire freefall, half of the canopy ride and the parachute landing on the beach. 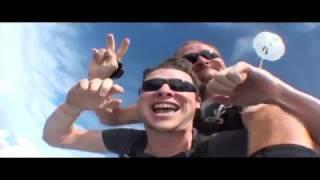 Tandem Skydiving is the best way to do your first skydive - secured to an experienced instructor. First things first, you will be fitted with a harness. - Have the jump explained to you. - You are secured to your Instructor by four strong points. - Take in the coastal views on the way to height. You'll see Fraser Island, Carlo Sandblow, Double Island Point and the Coloured Sands of Rainbow Beach. - Then it's exit time. - Go silly in freefall reaching speeds up to 220 kilometres per hour! - Soar like an eagle under parachute taking in the amazing views again. - Top it all off with a beach landing - you will land right on the sand on the main beach in front of town. Combined total weight of two tandem passengers jumping on the one load is 175 kilograms.